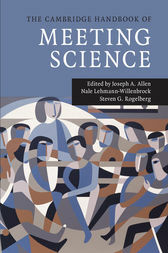 This first volume to analyze the science of meetings offers a unique perspective on an integral part of contemporary work life. More than just a tool for improving individual and organizational effectiveness and well-being, meetings provide a window into the very essence of organizations and employees' experiences with the organization. The average employee attends at least three meetings per week and managers spend the majority of their time in meetings. Meetings can raise individuals, teams, and organizations to tremendous levels of achievement. However, they can also undermine effectiveness and well-being. The Cambridge Handbook of Meeting Science assembles leading authors in industrial and organizational psychology, management, marketing, organizational behavior, anthropology, sociology, and communication to explore the meeting itself, including pre-meeting activities and post-meeting activities. It provides a comprehensive overview of research in the field and will serve as an invaluable starting point for scholars who seek to understand and improve meetings.